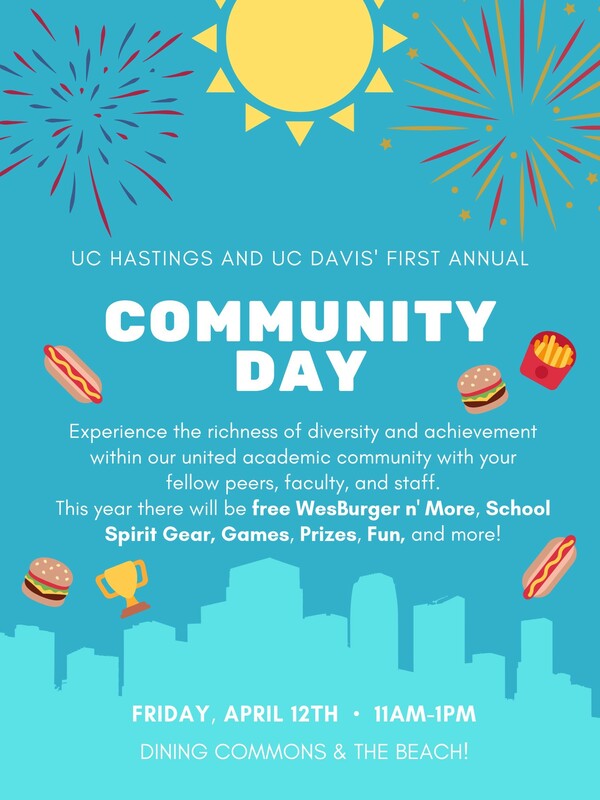 Join us on Friday, April 12th for UC Hastings and UC Davis’s 1st Annual Community Day! There will be food, activities, and booths from 11 am to 1 pm in the Dining Commons, Patio, and Beach! Experience and learn more about the richness of diversity and achievement within our united academic community! With food and games that involve on campus organizations and departments there’s something for everyone to enjoy. Spend Friday afternoon with your fellow peers, faculty, and staff and experience what makes this community so special. This year there will be free WesBurger, School Spirit Gear, Games, Prizes, and more!